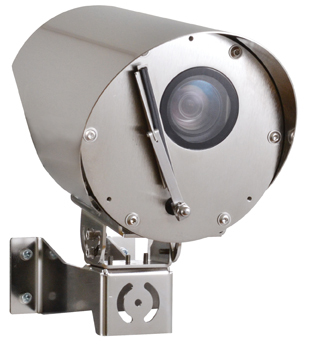 The Italian manufacturer Videotec is launching NVX, an IP full HD low-light camera with corrosion resistance. This camera includes the DELUX imaging and encoding technology for recording clear colour video day or night, the makers say. It's sensitive light sensor works with the DELUX technology to provide colour rendering and maximum noise reduction in very low light of 0.006 lux, or 0.0006 lux in black and white. Video images can be transmitted via network with H.264/AVC, MPEG4, MJPEG or JPEG compression, and it's possible to have up to three simultaneous and independent Full HD video streams. The NVX external housing is made entirely from AISI316L stainless steel and has a compact and light design that, with the rapid connectors, helps with installation and maintenance. The wiper and the modular bracket for wall, ceiling or parapet mounting come as standard. The firm adds that the range is designed to perform in the sea and rail sectors, motorway tunnels and factory applications such as the food sector.